Double Coin Trailer Tires at Pete’s Tire Barns. The Double Coin Dynatrail Plus ST Radial Trailer Tire features an advanced tread compound designed to decrease rolling resistance for increased fuel economy and longer tread life. The Double Coin Dynatrail Plus ST Radial Trailer Tire was designed for excellent shock absorption and superior load handling performance. The steel belted construction gives the Double Coin Dynatrail Plus ST Radial Trailer added strength and towing stability. 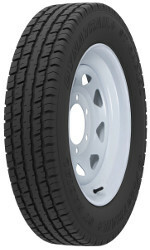 The Dynatrail Plus tire is available in a variety of sizes to fit most of the trailers in use today.